Is there anything quite like getting a letter? Though hearing your phone "ping" when you get an e-mail or text can be phone too, there's nothing like holding a letter in your hands and feeling the weight of the paper. 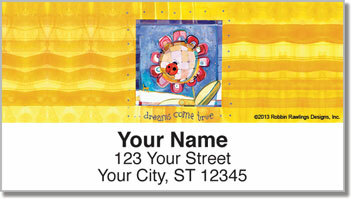 Now you can even add a little something more to the experience with these vibrant address labels from artist Robbin Rawlings. A talented artist with a loose, sketch-like style and unique combination of colors, you're sure to impress the receiver. Order today and get shipping absolutely free.